The Princeton PiggyBack® Delivery System is a proven method for delivering beverages that has revolutionized customer service and delivery efficiency. The Princeton PiggyBack® Delivery System enables you to convert your regular bay trucks into a bulk delivery vehicle. The light weight forklift dismounts in less than 60 seconds, and can be used in any weather conditions. Instead of waiting for an available loading dock, your driver can start unloading right away. Product can be entered through the back door by a regular pallet jack, rather than waiting in line with the rest. It is also handy for large volume C-store deliveries, fair grounds deliveries or any other situation without a loading dock. Time studies have proven that the Cost Per Case(CPC) is lower with a truck-mounted forklift than with any other unloading device. Compared to manual unloading, you can save up to 50% on unloading time, while eliminating a co-driver. Some companies have decreased their CPC with more than 35%. 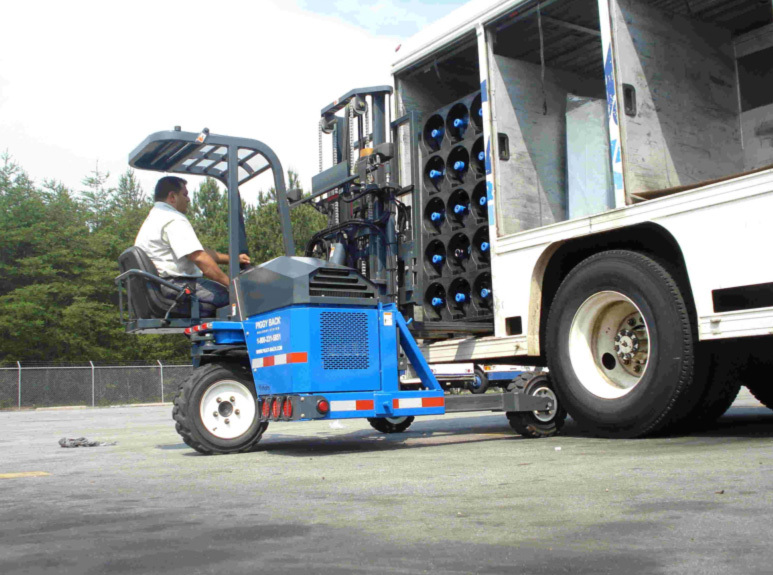 The truck-mounted forklift can be mounted behind almost any existing truck or trailer. Princeton offers models tailored towards the demanding needs of the beverage industry.